MONTPELIER, Vermont, August 30, 2011 (ENS) – At least 24 people have died across eight states as a result of Hurricane Irene, according to emergency officials. After first making landfall in North Carolina on Saturday, August 27, Irene had decreased to tropical storm force by the time it reached Vermont late on Sunday. Nevertheless, the impact was devastating. Three people in Vermont lost their lives, nearly 300 roads and 30 bridges are closed, rail traffic has stopped and the state office complex was shut down. Irene dumped heavy rains on the state late Sunday, causing flash floods, forcing hundreds of evacuations and leaving 40,000 to 50,000 people without power. Today, two days after the storm, nearly 20,000 Vermonters are still in the dark. Senator Sanders, an Independent, accompanied U.S. Federal Emergency Management Agency Administrator Craig Fugate today, inspecting heavily-damaged areas of the state. They were joined by Senator Patrick Leahy, Congressman Peter Welch and Governor Peter Shumlin, all Democrats, at stops in Ludlow, Wilmington, and Brattleboro. Later, they flew over other flood-damaged parts of the state to assess the damage. Sanders on Tuesday spoke with Transportation Secretary Ray LaHood about the need for the federal government to help make sure Vermont can rebuild its transportation infrastructure after the powerful floods ripped up roads and destroyed bridges across the state. On Monday, President Barack Obama signed an emergency declaration for Vermont and ordered federal aid to supplement state and local response efforts. Relief operations continued on Tuesday and will continue into the night. Road crews report progress on state and local roads, supplies have been delivered to some towns in need, and more recovery efforts were coordinated for the coming days. The Vermont National Guard used helicopters and trucks to deliver supplies of water, food, medicine, diapers, formula, and other necessities to at least 13 communities that have been cut off by flooding or have limited access. Engineers from the National Guard in Maine will be deployed to Vermont in the next several days to help with road reports, and helicopters from the Illinois National Guard are coming to help with commodities. Governor Shumlin, speaking on “Democracy Now,” a TV and radio news program, pointed to climate change as the cause of the extreme weather the United States, and particularly the colder states, have been experiencing this year. 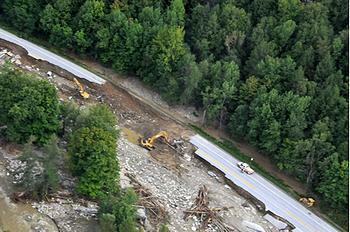 Since Shumlin took office seven months ago, there have been two major disasters as a result of storms. “We had storms this spring that flooded our downtowns and put us through many of the same exercises that we’re going through right now. We didn’t used to get weather patterns like this in Vermont. We didn’t get tropical storms. 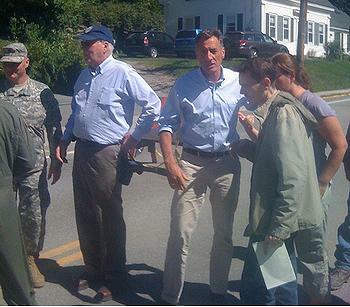 We didn’t get flash flooding,” said the governor, who grew up in Brattleboro.